It’s safe to say we’ve all been to a wine tasting, or at the very least watched the movie “Sideways”. But did you know on the Central Coast, alongside the grapes, olives are growing? Juicy, delicious, tangy olives, from which is produced some of the finest oils in the world. We have sat in the Pierce Ranch tasting room in Pacific Grove, and stopped at the Laetitia Vineyard & Winery along PCH in Arroyo Grande, but we’ve never been to an olive oil tasting room. We decided it was time. Just shy of throwing a dart at the map, we chose We Olive in Paso Robles. Situated in picturesque downtown Paso Robles, described to us as “an old cowboy town” by Anderson Inn owner Molly Anderson, We Olive is a bright spot among antique shops and souvenir traps. Come in with an empty stomach and a willingness to trust your pourer, and you’re in for a grand time! Don’t be afraid – it’s not only safe to drink olive oil out of a cup, it’s super healthy and you won’t need a designated driver if you go a little overboard. When you walk in, you’ll notice that everything is available for tasting. Tapenades, dips, dressings, and marinades, with bits of bread. Soaps, hand creams, lip balms and other body care products. I personally loved the lavender olive oil hand creams. 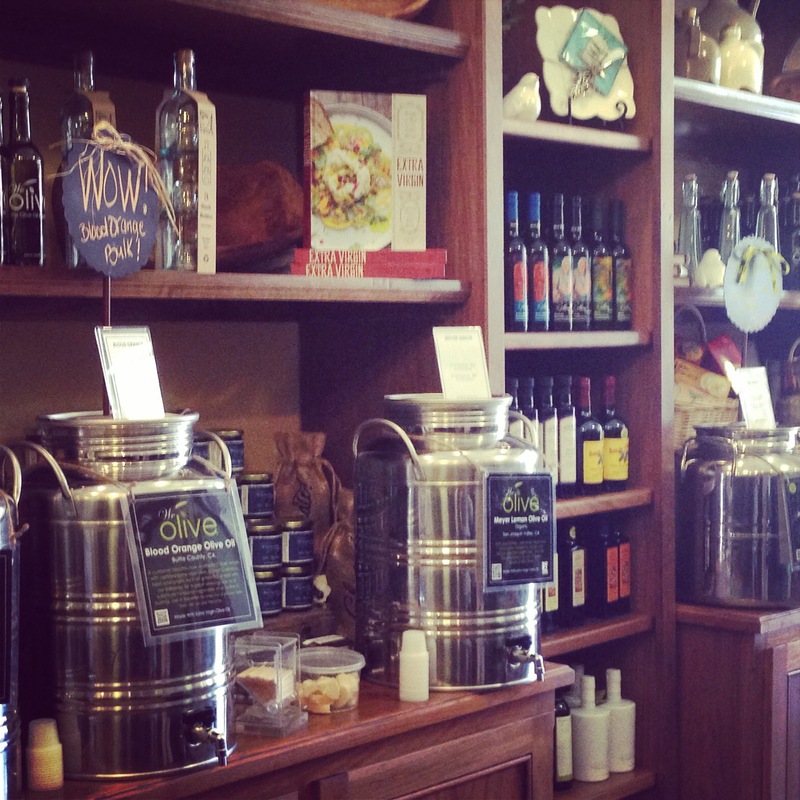 But the main focus of the shop is obviously the casks of oils and vinegars, beckoning you to try them. At first, we were a bit shy. Was it really possible that you could just walk up to each and take a sample of the oil? That seemed a bit cheeky. I’m Italian, so I have actually sipped olive oil from a glass before, but this was pretty new for Friand. So if this is all new to you, too, let me give you some advice about olive oil tasting so you don’t look like a total newb. There are three qualities you taste for in an oil: fruitiness, bitterness and pungency. Take a bit of oil into your mouth and let it coat all the surfaces of your tongue. You’ll get the initial impression of the fruit itself, you may taste something sweet or buttery. You’ll taste the flavors change into some level of bitterness, and then you should swallow. We found out that the level of pungency (or peppery burn) in the back of your throat is actually measured by the number of coughs it gives you! We tried one oil that made us both cough once, which made our pourer, Britta, smile. Olio Nuevo, pictured left, is worth a visit to their website. A truly green operation, they take artisan craftsmanship and stewardship of the land to a new level. I was particularly impressed with the care they take of their workers and community. If you see any of these oils around, or want to order online, please do. This is a worthwhile company for those of us who truly care about how our food is produced, and who makes it. After our tasting, which consisted of about 10 oils, we moved on to vinegars. I admit, though I love balsamic vinegar, especially on fruit, I have never actually sipped it from a cup! But, since Britta was offering, I was drinking. I believe we tried at least 5 vinegars at the bar, and purchased a fig balsamic (which will make a great reduction for desserts) and an ancho chile vinegar. 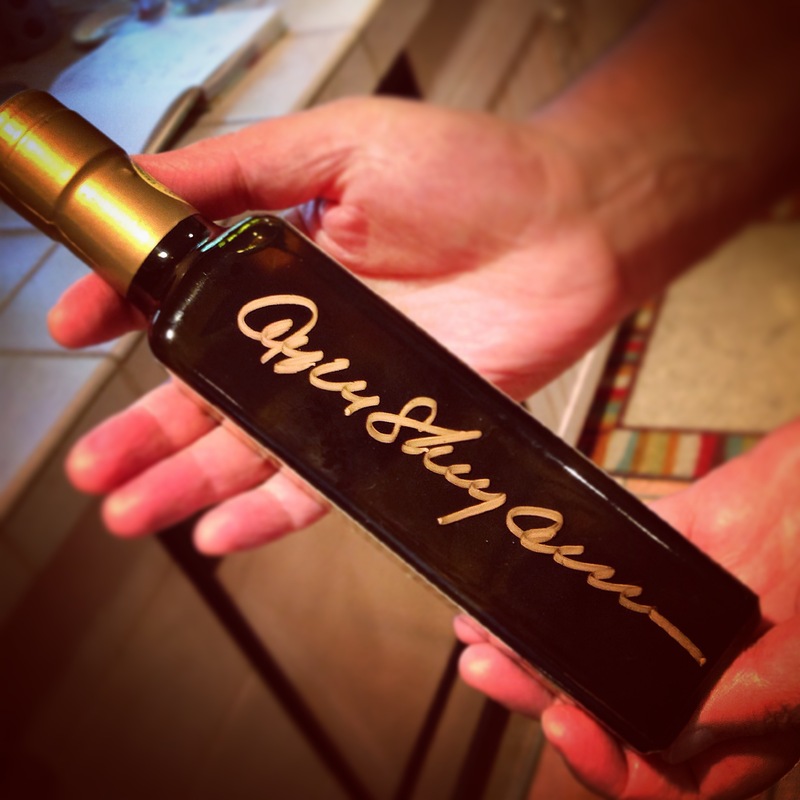 I was not so shy, after all these tastings, to then roam around the store sipping the other oils and vinegars. I absolutely loved the meyer lemon oil (pictured above) and an oddly refreshing pineapple vinegar. We walked out of the store with 4 oils, 2 vinegars, and an olive tapenade. As I sit here writing now, I’m considering pouring myself a little taste of the Olio Nuevo as a night cap. Don’t judge me. Leaving We Olive, we roamed the main street for a while, looking for a place to have lunch. Everything seemed a little too touristy for us – cafes and grilles, nothing worth checking out – until we returned to our car parked in front of We Olive. Next door was a nondescript store front, no signs, no lights, no menu, just a chalkboard on the sidewalk advertising “organic local ingredients”. We decided to give it a go… Stay tuned for the review. We Olive was a great time! I highly recommend making the side trip from PCH inland about 25 minutes to Paso Robles to this fun shop. Visit their website to find their other locations or to order online. And one last note: remember olive oil has the most health benefits when consumed raw. Use in salads, on bread, in dips, or straight out of a glass, but don’t cook with it! Worse than all the harmful effects of heat on your expensive oil, you’ll never be able to taste and enjoy all the complex flavors. Would you flambé with Pétrus? Every oil and vinegar was obviously vegan, but not true of every store. (Remember to read label if you’re going to sample). A vegan wonderland, We Olive gets 5 sprouts!